Obvious cost-cutting in base CD model? If you’ve read our test of the Astra five-door (Holden Astra CDXi 5 Speed) you’ll know that the small-medium size Holden is a solid, comfortable car – albeit short a few kilowatts. The body feels rigid, there’s good space and practicality and the styling is contemporary – it’s the sort of car we’d have no reservations suggesting to a wide variety of buyers. 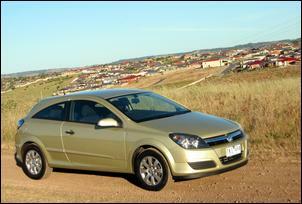 Give it a competitive price tag and it’s no wonder the Astra is currently the fifth best selling car in Australia. 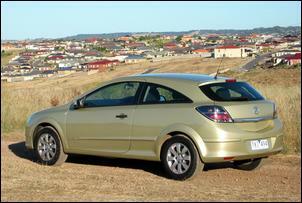 And that success looks certain to continue with the release of the attractively priced Astra coupe. 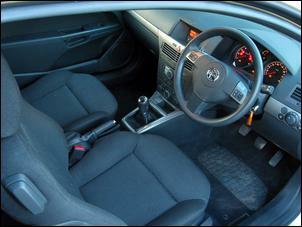 Rear passenger space, although not up to the standard of the five-door hatch, is perfectly useable and comfortable. Headroom is marginal if you’re over 185cm tall (there’s 44mm less rear headroom than the five-door) while knee/foot space is acceptable. Access to the rear seat is a bit awkward if you’re tall but the front seat is easy to slide/tilt using a single-action lever. The coupe has plenty of rear cargo space with its rear backrests in their normal position; fold the 60:40 split backrests forward and there’s an impressive amount of useable space. Up front, the Astra has firm seats and the multi-adjustable driver’s seat and adjustable reach/rake steering wheel ensure you’ll be able find a comfortable driving position. 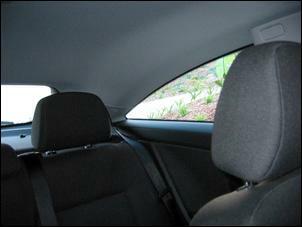 Unfortunately, the front seatbelts (which are anchored to the B pillars) require an awkward stretch. The majority of switchgear is intuitive but the indicators have a soft-touch function that refused to switch off on several occasions during our test. The instruments are basic and clear and, even in the base-spec CD, you get cruise control, electric windows, adjustable angle headlights, four airbags and a single CD/tuner with MP3 compatibility. The audio system sounds decent up to a reasonably high volume and the steering wheel mounted controls are excellent. 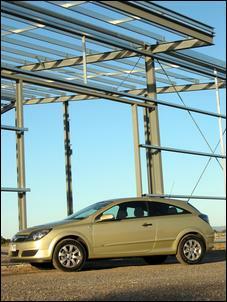 The Astra also has a very intelligent body computer which gives you time to close the electric windows after you switch off the ignition and incorporates a clever courtesy lighting strategy. The dashboard in the CD-spec Astra coupe is equipped with a multi-function display – an item which drags down the otherwise high-end feel of the cabin. The large pixel display gives you time, date, ambient temperature and audio information – but you miss out on the high resolution screen and trip computer fitted to the CDX model. The CD also comes without illuminated vanity mirrors, a CD stacker and a flip-down sunglass holder – items which are standard in the CDX coupe. 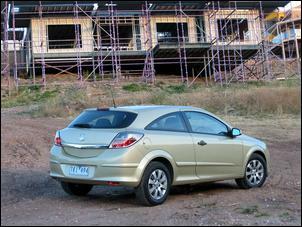 The Astra drives like a contemporary coupe should. The electro-hydraulic power assisted steering has good weight and reasonable feel although the relatively tall 65-series tyres on the CD model reduce steering precision. The 1243kg coupe handles securely with a measured amount of understeer to warn when you’re pushing too hard - the standard 195/65 15 Goodyear tyres are very progressive when pushed past the edge of adhesion. Interestingly, there’s no traction control but in the dry conditions during our test we doubt it would’ve made much difference – the Astra chassis is well sorted and engine output is relatively tame. With MacPherson struts at the front and a twin trailing arm torsion beam axle rear, the Astra coupe's ride is spot-on for its market – there’s firm damping at urban speeds but it’s always comfortable. The brakes are very responsive and offer excellent stopping with ABS, brake assist and four-wheel-discs. But one area that could be improved is the driveline. The Astra coupe’s 1.8-litre DOHC engine (as fitted to the rest of the range) is fine overall – but nothing more. On normal unleaded fuel, maximum output is 90kW and there’s 165Nm of torque at 3800 rpm – running premium unleaded adds 2kW/5Nm. Coupled to a relatively short geared five-speed manual, the engine is useable over a broad rev range and it ‘comes on’ noticeably at around 3500 rpm. Our testing shows the Astra coupe is a high 10 second 0 – 100 km/h machine – its performance is acceptable in normal driving but falls short of what you’d expect from a coupe. If you want an Astra coupe with performance you’ll have to wait for the turbo version which is expected to arrive early this year. Fuel economy was only average in class during our test – we recorded around nine litres per 100km over a variety of conditions. Interestingly, the engine is prone to detonation in stop-start conditions when using normal unleaded fuel. 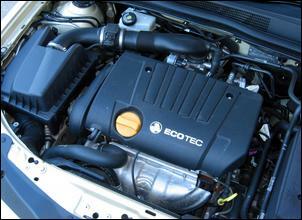 The use of premium unleaded eliminates this and brings sharper engine response. Fuel tank capacity is the same as the five-door model at 52 litres. So what about the Astra coupe’s appearance? Well, many people admire the coupe’s lines while others see it as merely a mutation of the hatchback. Interestingly, the car looks much better when viewed from a distance – its overall shape comes together better than when inspected up-close. The 15 inch alloy wheels of the CD model also look under-cooked. The assembly of the body, interior fit and finish are excellent. The Belgian-manufactured Astra has the feel of a more expensive Euro thanks to the rattle-free cabin, quality trim material and quiet-closing doors. Our only criticism is the afterthought appearance of body sealer in the spare wheel well. Like its five-door stablemate, the Astra coupe is the sort of car that quietly goes about doing everything well - but be aware there is a visibility and rear passenger space penalty to pay for in return for the sportier body profile. At AUD$23,490, the Astra CD coupe is a bargain buy but, for an extra AUD$2410, we’d be tempted to look at the upmarket CDX version which brings 16 inch alloys, a higher equipment level and better interior trim - this would complete the car’s sophisticated feel. And if you want performance, you’ll have to wait for the turbo model.